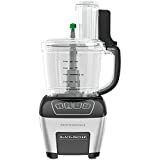 To help you in selecting a good food processor, we compiled a list of the top 10 best food processors in 2019 that you can find on the Amazon e-commerce platform. This Ninja Master model is the best for the bargain shopper. The 400-watt machine comes with a very affordable price. Thanks to its unique Quad Blade design, the food processor crushes and cuts with high precision. It comes with a 6-cup pitcher and a 2-cup chopper bowl. This Cuisinart model is the best mini food processor. However, despite its small dimensions, this little machine excels at all tasks. One of its advantages is that it is not only lightweight but also very simple to use. When it comes to professional tasks, it outperforms most of the other mini choppers. With its 3-cup capacity, it is also very easy to store, being optimal for a small kitchen. It comes in various color options. The Pampered Chef is considered to be the best food chopper out on the market today. 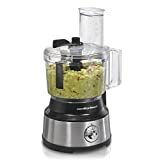 This food processor can quickly chop herbs, fruit, vegetables, nuts or any other food products you need. By using this little tool in your kitchen, you can save a lot of time in cooking. Especially for those who are not comfortable using a knife to chop or mince, this machine is a great choice. It can also be easily cleaned in a dishwasher of you first disassemble its parts. This powerful food processor comes with an 800-Watt motor. The machine can easily perform any dicing, slicing or mixing tasks you may need. It comes with useful accessories for adjustable slicing and simplified dicing. Among these attachments are included a chopping blade, a dicing disc, a dough blade, stainless steel slicing and shredding disks. The food processor comes with two work bowls: a smaller 4-cup work bowl and an extra large 11-cup work blow. This way, you can select the right bowl size for the job. The touchpad of this machine comes with digital controls that include a pulse button and 3 different speeds. The digital panel is easy to clean. To add even more stability during operation, the heavy-duty stainless steel base is kept in place with skid-resistant feet. The food processor comes with a compact storage case that fits all removable parts conveniently so you can save space and stay organized. 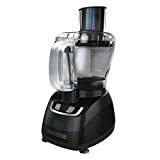 This Cuisinart food processor model comes with various accessories, including the spatula, three slicing/shredding discs, and new chopping blade. The machine is ideal for shredding cheese, slicing vegetables, mixing batters, making dough, mincing garlic and herbs, and emulsifying. Its capacity of 11-cup work bowl is large enough to accommodate a family. For larger food slices the extra-large feed tube is doing a pretty good job. According to experts, this could be the best food processor for saving time. The Hamilton Beach brand has the good reputation on the market of small kitchen appliances. This food processor stands out for its bowl scraper. The 10-cup food machine will save you the proper amount of time. Because of the smart handle, you can scrape from outside while the food processor is working instead of stopping to scrape the sides of the bowl. This food processor is best for everyday cooks. This KitchenAid machine stands apart from similar appliances due to its ExactSlice System. Thanks to this technology you are to control the thickness of foods. If you enjoy preparing scalloped potatoes or other dishes that require precision, this machine is a perfect choice. The KitchenAid KFP0922CU 9 comes with many useful accessories, including a 3-cup and a 9-cup bowl, as well as the 3-in-1 Wide Mouth Feed Tube. The feed tube allows a simpler processing of different size foods. This 8-cup Black+Decker model is best for novice cooks. 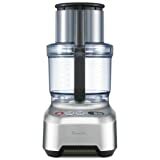 It is a budget friendly food processor perfect as a starter appliance if you are working in a smaller kitchen. This Cuisinart 14-Cup food processor is best for an advanced cook. With this model, you can even mix dough due to its powerful engine. Home chefs can enjoy preparing big portions at one time with this 14-cup machine. The food processor is versatile and can help preparing for a variety of dishes, unlike the lower-end choices. The Breville BFP800XL Sous Chef machine is best for your bucket list. This premium food processor matches in quality the appliances you see on TV cooking competitions. However, its premium quality comes with a premium price. This machine comes with all the features you could expect from a very large 16-cup capacity and a high-end model. Among its fancy features are included an accessory case for each of the attachments, auto-pulse, a count up/down LCD timer, a French fry cutter, a dough hook, and a whisking disk. For your smaller chopping tasks, you also have the option to switch to a 2.5 cup bowl. No matter what capacity you may need, Breville and Cuisinart remains outstanding choices in food processors. However, if you really do not need the heavy-duty capacity provided by these two top brands, you can also choose a Hamilton Beach model as a very affordable alternative.